As Cairn Agri Fellows, these young farmers in Rajasthan are boosting production on their family farms and launching sustainable agribusinesses. Last spring, they sat in a classroom staring bemused at a blackboard scribbled with profit and loss calculations. These young farmers, ranging in age from 18 to 30, were far from their fields getting their first exposure to advanced agricultural practices and agribusiness. As Cairn Agri Fellows, or CAFs, the young men and women were a pioneer group of 21 students participating in a 15-month course to increase agricultural knowledge and improve livelihoods in the community. One year later, certificates in hand and a spring in their step, the graduates are putting their newly acquired knowledge and skills into practice at their family farms and launching their own enterprises. They have blended their traditional knowledge with formal classroom learning and field training. CAF training has given me a new perspective on agriculture. Now I am confident of approaching agriculture as a business venture. CAF is a component of Barmer Unnati, a local economic development program implemented by TechnoServe in partnership with Cairn India Limited in the desert district of Barmer in Rajasthan, India. As part of their CAF journey, the young farmers received 10 weeks of agronomic training at the Institute of Agri Business Management at Bikaner. 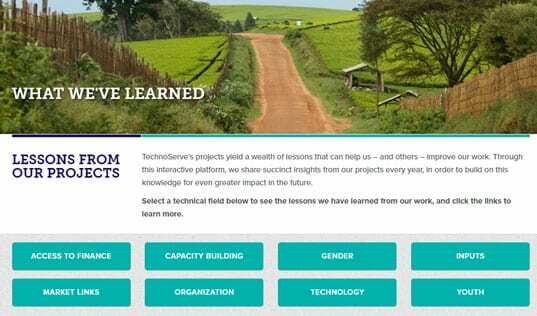 Back at their villages, they participated in 12 months of field training and intensive apprenticeship with TechnoServe, and attended one week of business management training. The young farmers learned about setting up their own enterprises and chose one of several specializations: commercial dairy farming, goat farming, mushroom cultivation, horticulture (date palm and pomegranate), or an input shop business. They received further practical training at field units located in different parts of the country – the first time many of the CAFs had traveled out of their home district. Today, the CAFs are well on their way to becoming successful farmers, entrepreneurs and community leaders. Rajat Kumar (left) launched a dairy enterprise during his Cairn Agri Fellowship. Rajat Kumar, 20, completed high school in his village of Kawas, but gave up further studies in order to contribute to his family’s 1.5-acre farm. As a Cairn Agri Fellow, he opted to specialize in commercial dairy farming, and traveled to Haryana state for training at the National Dairy Research Institute. 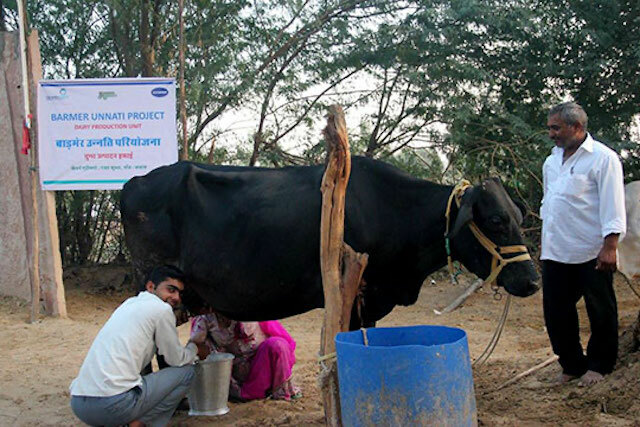 In April 2015, Rajat launched a dairy enterprise with only two animals. Today he owns nine heads of cattle and sells 46 litres of milk per day. 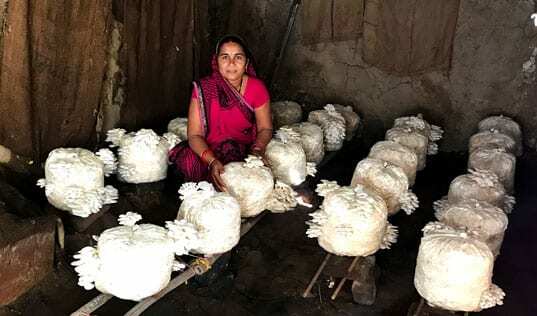 Ever entrepreneurial, Rajat started preparing vermi-compost from cow dung, bringing his dairy business’s profits to $460 (Rs 30,600) per month. During the CAF course, Rajat also learned budding and grafting practices, which he applied to two underperforming ber fruit trees on his farm, significantly improving their yields. He has since performed grafting on 300 trees in his village, earning additional income. “CAF training has given me a new perspective on agriculture. Now I am confident of approaching agriculture as a business venture,” says Rajat. 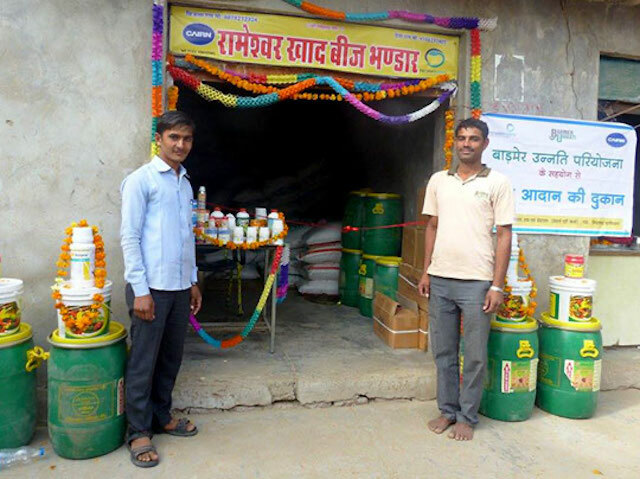 Bijala Ram and Deva Ram provide agronomic advice at their new input shop. Bijala Ram and Deva Ram, both CAFs from the same village of Sindhasawa Harniyan, became partners and started their own input shop. The store was inaugurated in January 2016 at an event attended by Cairn representatives, local village officials, community leaders and 150 farmers – a great promotional opportunity for the business. 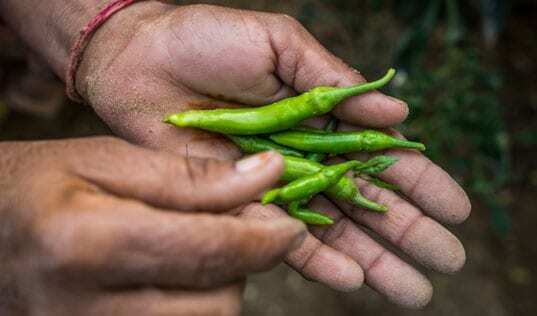 Apart from selling farm inputs like seeds and fertilizer at reasonable prices, Bijala and Deva provide valuable advice on agronomy – gleaned from their own CAF training – and guide farmers on appropriate methods of application and utilization of inputs. The shop’s monthly sales revenue average $7,500 (Rs 500,000). Meanwhile, farmers in the area who used to travel 20 kilometers to purchase the same inputs, benefit from easier access. Lala Ram (left) is expanding his family's goat enterprise. Lala Ram’s livelihood has been traditional goat farming supplemented with monsoon crops, such as millet and rice. After the CAF training, Lala Ram expanded his goat enterprise with the addition of 11 Sirohi goats. Raised for meat and milk, this breed, native to the Sirohi district of Rajasthan, is known for good body weight and meat quality, affording additional profits on the sale of each goat. Lala Ram also established a shed and proper fencing to prevent cross breeding, and improved the nutrient composition in his feed. With CAF training under his belt, Lala Ram is becoming more competitive in his chosen field. 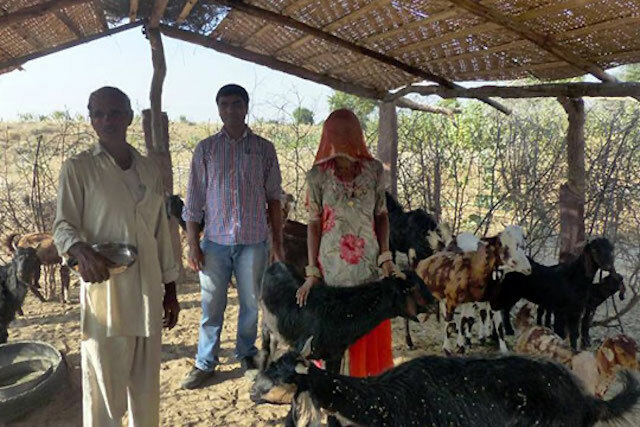 Farmers turned entrepreneurs, the Cairn Agri Fellows are now driving change in Barmer district, fulfilling the hopes and aspirations of their families and communities, and making a lasting impact on the productivity of the farms in the region.